Change Your Oil: Follow your vehicle's owner manual to see how often you should have various services scheduled. Typically, the rule of thumb for a vehicle is every 5,000 miles or so, but this will depend also on the type of mileage you put on your vehicle. If you're in a lot of stop-and-go traffic or drive in extreme heat, 3,000 miles might make more sense. And remember to change the oil filter as well. Check Your Fluids Every Month: It only takes a second, and it can help you avoid major and costly problems down the road. 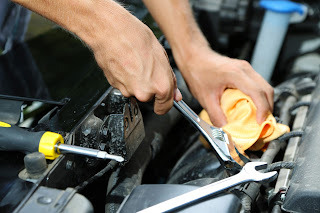 You should check your oil, brake fluid, transmission fluid, coolant, and power steering fluid once a month if you can. Have Your Tires Rotated and Check Tire Pressure: You should have your tires rotated just about as often as you get your oil changed. Rotating your tires evens out wear, so your front tires don’t wear out before your rear tires. Also, make sure your tires are properly inflated so you get the best gas mileage on those longer drives. Get the Hoses Checked: Have your belts, clamps, and hoses inspected for tightness and overall condition by a qualified mechanic. The cold weather can weaken these, which could cause a breakdown – something nobody wants. It can't hurt to have these checked when you go in for an oil change or tire rotation. Go to the Car Wash: There's no question that the winter months can wreak havoc on a car's exterior. Now that the weather is getting warmer, make a trip to the car wash or do it yourself. Your car will look nicer, and you will prevent rust from forming. Are you thinking about buying a new car? Spring is the great time to look at new or used cars in New Jersey. And one of our salesmen would be happy to help. Come to showroom today on Rt. 22 in Springfield, NJ to find a great vehicle at an even better price.